An inspired India made amends for the drubbing at Centurion with a sensational 87-run victory against South Africa in the low-scoring second cricket Test to level the three-match series 1-1 in Durban on Wednesday. After setting a target of 303, the Indian bowlers put up a disciplined show to dismiss the hosts for 215 in 72.3 overs about an hour after the lunch break to record only their second Test triumph on South African soil. It turned out to be an extraordinary Test with fortune fluctuating from one team to the other but the Indians eventually tilted the balance in their favour on a bouncy Kingsmead track which saw 40 wickets fall in three and half days. The Indians, who had lost the first Test at Centurion by an innings and 25 runs, showed great character and resilience to demolish the Proteas in their own den and in conditions tailor-made to suit the home team. The Indians players jumped in joy and hugged each other after last man Lonwabo Tsotsobe was run out to bring about the moment of glory while coach Gary Kirsten and the other support staff stood up at the dressing room to applaud the players. S Sreesanth (3/45), Zaheer Khan (3/53) and Harbhajan Singh (2/70) were the pick of the bowlers for India while Ashwell Prince was the top scorer for the South Africans with an unbeaten 39. 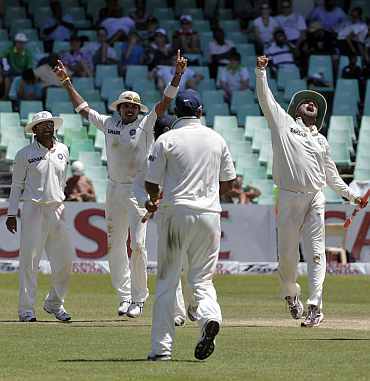 It was India's second Test triumph in South Africa. 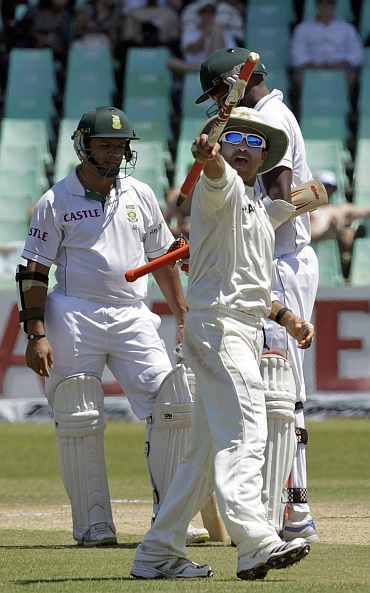 The 123-run victory in the first Test at Johannesburg in 2006 was their first Test victory on South African soil. The two teams will now travel to Cape Town for the third and final Test starting on Sunday. Both teams had an equal chance of winning the match when play began this morning with South Africa needing 192 runs and India needing to scalp the seven remaining wickets. With plenty of time at hand, South African batsmen adopted a cautious approach in the morning and were content in playing the waiting game against some disciplined Indian bowling. Resuming their chase at the overnight score of 111 for three, both de Villiers and Jacques Kallis found the going tough against the Indian attack and scored in ones and twos before a ripper from Sreesanth broke the dangerous-looking 41-run fourth-wicket stand. The Kerela speedster came up with a blinder of a delivery that bounced sharply on to Kallis from just short of length and the big man had no other option but to fend at it, only to glove it to Virender Sehwag at gully. Kallis made 17 off 52 deliveries and hit two boundaries in the process. It seemed Indian captain Mahendra Singh Dhoni came out with a perfect plan as he started the day's proceeding with off-spinner Harbhajan Singh, who bowled in tandem alongside Sreesanth and Zaheer Khan. Dhoni's tactic bore fruit as Harbhajan inflicted the second big blow of the morning to South Africa by dismissing another danger man de Villiers (33) leg-before-wicket even though TV replays showed the South African was unlucky. Bowling from round the wicket, Harbhajan tossed one up on off and middle and got it to bite and straighten which struck de Villiers around the knee in front of the stumps and umpire Asad Rauf had no hesitation in raising the finger but replays later showed the ball was going above the stumps. Soon after de Velliers wicket, another dubious leg-before-wicket decision ruined South Africa's morning when Zaheer Khan dismissed Mark Boucher in the 43rd over. 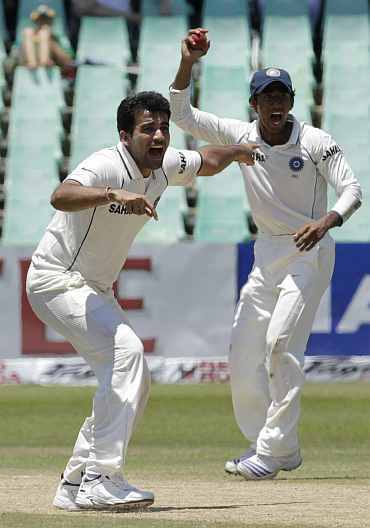 Zaheer then took India closer towards victory dismissing Dale Steyn (10) caught by Cheteshwar Pujara at third slip after the right-hander went for a flashing drive only to get an outside edge. But a resolute Prince remained a thorn in the flesh for the Indians as he joined hands with Harris to lead South Africa's fightback and frustrated the visitors with their eighth-wicket partnership. Zaheer broke the 27-run partnership immediately after the lunch break by bowling Harris with a gem of a delivery, which moved in to clip the bails. Morne Morkel, who joined the action after Harris' dismissal, went for his strokes to ease the pressure and the strategy seemed to work as South Africa crossed the 200 mark to give some anxious moments to the Indians. But Ishant came to his team's rescue by evicting Morkel (20) and bring India within sniffing distance of victory. Last man Lonwabo Tsotsobe did not survive long as he was run out, thanks to some smart fielding by Cheteswar Pujara at short leg.